Hadoop provides various writable classes like IntWritable, Text, LongWritable, ObjectWritable etc..It also provides flexibility to its developers to use APIs and extend some of the functionality to achieve organization goals. In this example, we will discuss how to create custom writable classes and use that classes as a map reduce program. In our previous post we have discussed how to use the custom writable class as a map-reduce value class. 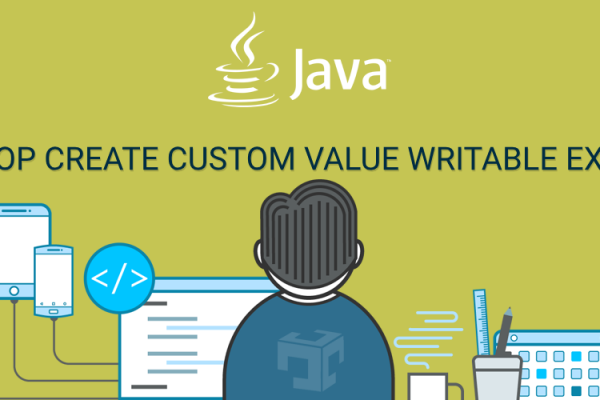 In this article, we will focus on custom writable which can be used as map-reduce key as well as value class. Let’s discuss all the steps to create our own custom writable data types which can be used as MapReduce key class or value class. In this example we will create a custom writable datatype which used as MapReduce key class as well as value class. create custom writable should implement WritableComparable interface to use as a map reduce jobs key and value class. Override write method and add logic to write all the fields value. In case of list or collections, first write size of the collection variable and then write all the value into it. A read fields method will read all the fields value from input stream. We must follow the same order of read and write of a data members. The final step is to add one default constructor to allow serialization/deserialization of a custom data types. 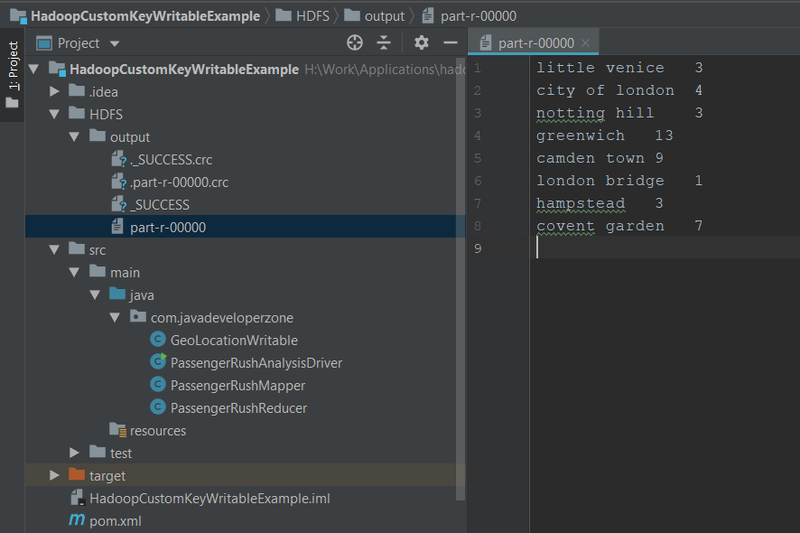 As we use our custom writable as a map-reduce key class we need to override equals and hashcode method to get the desired result. The entries in passengerRush.txt file are in the following format. Consider one new Project where we got requirements from one taxi agency and they want to analyze passenger rush in the different location of London city. Based on the result they will analyze results and can reschedule taxis to gain more money. Taxi agency will collect all the taxi data from past 2 months and our job is to parse this input data and give location names where more number of passenger uses a taxi. As we see in sample input, we have latitude, longitude, location names with all the taxiID along with a number of passengers take a trip. We need to write a custom writable class of geolocation data and compare at which location more number of passengers uses taxis. Hadoop Custom value writable is ready. Compile and create jar files, copy sample input file to HDFS and run below command. Here, In this conclusion of Hadoop Create custom key writable article, we can say that many use cases where default writable classes are not best suited for some requirements. We can create our own custom writable classes by implementing WritableComparable class and override its method to achieve our goal. Apache Hadoop provides all the functionalities to solve any real word problems and helps to build word class analytics tools. You can also check our Git repository for Hadoop Custom Key Writable Example and other useful examples.